This should be the top of the range Low voltage Op-Amp from Analog Devices. 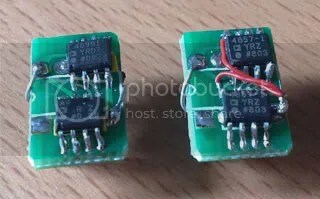 The pin out is different from the standard single op-amp, Like the first exotic there are different mode of operation. Look at a chose up picture of Chip, Note that there is a heat spreader at the underside of the the Chip. I was surprise the the high are close to the AD8599 in terms of clarity, Very quick as well. Usually when something is mellow it is not clear. But this has both. Neutral sound. To the right is 2*ADA4857-1. That is different from the standard single op-amp as well, Note the rework wires on the chips. But It did not make it to my exotic list of Op-amp for the D10. 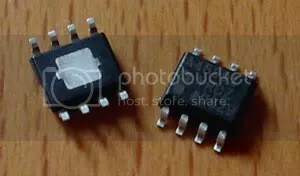 How does the ADA4857 sound ? Very sorry because I audition the ADA4899 just before this. Not comparable, but still very strong. It still beats OPA2350 (non class A, I do not have a class A OPA2350 as yet) slightly in the mid and is much clearer in the highs. The ADA4857 is a very detail amp, I heard things I never heard before. I think plenty of people will like this especially people who like the UE, JH IEM rather than the Westone camp. If you like string instrument this is for you. The guitar in Eva Cassidy’s “I know you by by heart” is strikingly life like. For people whose primary interest is in woodwind instrument and vocal, ADA4899 is better.